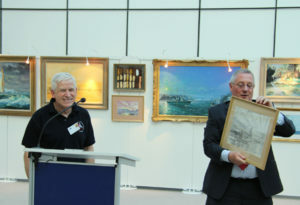 “The Marine Art of Gordon Frickers” exhibition was held in May 2011 in the European Parliament, Brussels. Gordon Frickers is one of the very few artists invited to exhibit at the European Parliament, the only Marine Artist to do so. This was the first time a collection of significant works of the Art of Gordon Frickers had been exhibited. The originals and/or prints of each of the paintings illustrated on this page were on display at the exhibition. The catalogue from the exhibition has now sold out. Mr. Brian Simpson, Chair of the Transport and Tourism Committee of the European Parliament, wrote an introduction for the catalogue, For your convenience it is copied below. «I would like to extend a warm welcome to ‘Life on the Ocean Wave‘ by Gordon Frickers. Whilst searching for information about my father’s ship, the aircraft carrier HMS Formidable , known to her crew as ‘ Formid ‘, I discovered The Marine Art of Gordon Frickers. “ HMS Formidable , 1942 sunset, Seafires returning” astonished me and I’m very pleased that it is shown here today. The ariel sky, fluid sea, with mysterious light and colour. I discovered Frickers’ colours are sometimes surprising yet always harmonious and entertaining, the details charmed me, even down to the way a Mark II Seafire is shown landing, typically weaving because the pilot could not ‘see over the nose’ during final approach. Gordon’s paintings have a remarkable vitality that draws the observer into the picture, often making one feel one is ‘there’. Speaking with Gordon Frickers it was soon apparent that while Gordon is very sociable he rarely exhibits. I was astonished to discover Gordon has got to where he is entirely on merit working mostly to commission or on subjects of his choice. I remain surprised that The Art of Gordon Frickers has no sponsor, no patron, no major galleries, no marketing; it is success on merit. It is our good luck and thoroughly appropriate to have the Frickers marine paintings here at the European Parliament and we are doubly fortunate to have assembled, for the first time, some of Gordon’s most significant works to display under our roof. We know four fifths of our planet is covered by sea and ocean. The sea is a place of transport and tourism, a place where we work and play. The sea is vital to Europeans, the vast majority of our exports and imports continue to travel by sea. The sea is a job for rugged clever people. Europeans are wedded to the sea as possibly no other people. The sea is as much our cultural cradle as agriculture and manufacturing, philosophy, innovation and our arts. The sea is part of us as we are part of it. The sea is a place of movement, of ideas, challenges and change, of heading for destinations, sometimes new destinations. We learnt to navigate by the stars and someday inspired by the sea our new ships will voyage to the stars. As I explored his website I was next surprised by his versatility. Few artists can handle modern and ancient shipping so well. In each of the paintings that are Frickers’ work we find a theme, sometimes great, sometimes small, there is inevitably a story about us and the people who laboured to shape our modern world. Frickers is an ambassador today and for future generations for our marine world. I recommend The Art of Gordon Frickers as exceptional, a joy to own and a sound investment.